This race was a long time coming. I have improved in every distance over the last couple of years except for the marathon. All prediction charts pointed to a sub 3:10 marathon but I kept coming up way short - usually crashing and burning, especially with any kind of warmer weather. I had a 3:15 and 3:18 to my name but those were 2 years ago and I haven't been close since. I thoroughly enjoyed Boston 2011, but had no sign I could get back there, especially with the harder qualifying times. Last summer I decided to try running more consistently and see if I could stay healthy. I was typically a 4 day/week runner and became a 6 day/week runner over the course of a few months and remained injury free. I discovered many of my miles were slower paced but when I did put in the quality workouts, my speed increased (Lydiard was on to something). I had a bad showing at a humid marathon in late October which just added fuel to the fire. 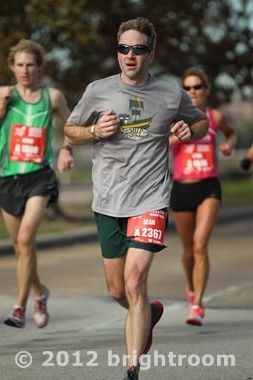 I wanted to BQ with at least 5 minutes of cushion at Houston in January - the last marathon in my 30s. I have run Houston 3 times prior and usually do very well. I kept adding miles and built up my weekly mileage into the mid 70s (they used to max out in the 50s). I avoided racing so I could keep up consistent mileage. I did one informal 10 mile race around Town Lake the day before Thanksgiving in 65 minutes and knew my body was responding well to the higher mileage. I also lengthened my long runs - I put in a 24 and 25 miler 5 and 3 weeks out from Houston. Usually I maxed out at 22 but thought with my recent crash and burns, I needed some confidence and stronger legs. The last tweak was the taper. I didn't understand how I can put in a 24 miler in similar humid conditions on tired legs and not crash and burn, whereas I cramped at mile 18 during a humid marathon. I decided that my legs were more stale than fresh entering into the previous races. I would reduce mileage during the taper, but keep up the consistency and not take as many days off. Nutritionally I would increase my salt intake gradually 10 days prior instead of the sudden electrolyte surge the day prior and the salt caps during the race. Mentally, I would try to view the race as a long tempo run on fresh legs. I put in a 25 miler 3 weeks out and felt good. My usual anxiety leading up to the race was there at times, but I definitely felt more calm than usual. I had a different game plan this time and was feeling confident. I started popping some salt caps about 10 days out and had the usual carb meals a few days out. I had one allergy/head cold episode on the Wednesday before the race but other than that everything went as planned. Throw in a forecast in the low 40s, watching the Olympic hopefuls racing the morning prior, and my confidence was high at the start line. My plan was to go out with 7:15 miles and see how it felt. Congestion got the better part of the first 1.5 miles (7:50, 7:17) but then I put the watch on a screen with no pace and went by feel for the rest of the race. I did have the mile splits flash up so I was not completely ignorant of the pace. The first half was filled with sub 7:10 miles pretty consistently with minimal effort so I stuck with them. I went sub 7:00 at miles 14/15 but then went back to 7:05ish. I had planned on Gu every 4 miles but forgot one at the start, dropped one, and ended up having no food by mile 17. I did eat every orange slice and banana I could find but that was it. Full cup of Gatorade Endurance and full cup of water at every station rounded out the nutrition. I saw my family and friends at mile 19, then had a streak of 6:50s for the next 6 miles, just felt incredible. 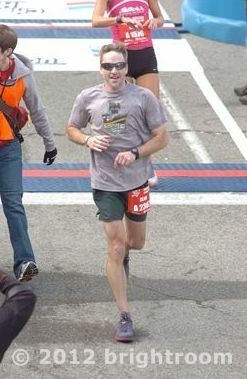 Once I passed the 3:10 pace group at mile 22 I knew I had a PR/BQ and it was just a matter of how low I could go. A running partner of mine bet me a free meal if I hit 3:07 so that became my new goal. I was not worrying about cramping at all. The pace crept back up into the 7:00s during the last 2 miles, finally running out of steam, but my form did not break and still felt like I finished strong. Ended up with a 3:06:47 and a 2 min negative split (1:34/1:32). That gives me an 8 minute cushion on my 40 yr old 3:15 BQ so I should be a shoe-in for Boston 2013.